The Independent Evaluation Office (IEO) of the United Nations Development Programme (UNDP) carried out an ‘Evaluation of the UNDP's contribution to poverty reduction in the Least Developed Countries (LDCs).’ The evaluation is part of the IEO medium-term plan (DP/2018/4) approved by the Executive Board in January 2018. The evaluation assessed the contribution of the country programmes, and global and regional programmes to reducing poverty, across five streams of UNDP support, viz., inclusive growth and employment, local economic development, sustainable livelihoods, early economic revitalization, and MDG/SDG integration. Cross-cutting programmatic principles outlined in the Strategic Plan, viz., gender equality and women’s empowerment (GEWE), and partnerships were assessed. All the LDCs in Africa, Asia and the Pacific, Arab States and Haiti in the Caribbean were covered by the evaluation. The evaluation, and management response, will be presented to the Executive Board for decision at the first regular session in 2019 and is expected to contribute to the development of corporate programme strategies on poverty reduction and sustainable development; and to strengthen UNDP's accountability to global and national development partners, including the Executive Board. 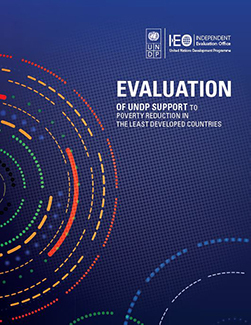 The UNDP Independent Evaluation Office, in addition to its main function – conducting independent thematic and programmatic evaluations – also contributes to capacity development for evaluation within UNDP and beyond, with national partners and the global evaluation community, in line with the 2030 Agenda for Sustainable Development. The IEO has developed an overview of this small yet highly relevant component of its work, for Board member information at the 1st Regular Session in 2019. Through this component, the IEO seeks to contribute to three intermediate outcomes through a series of interrelated capacity development activities and interventions: improved quality and relevance of UNDP-led evaluations; national evaluation capacities and systems are strengthened; and, global evaluation culture strengthened. The paper describes support to each of these three strands. Emphasis is given to the second stream, strengthening national evaluation capacities, a key component of which has been the National Evaluation Capacities (NEC) Conference series. 2017 represented a milestone -- with the conclusion of the fifth NEC Conference in Istanbul this past October, each UNDP region had hosted one of the conferences -- prompting the Office to reflect on the future of the series. Planning for the next conference is now beginning. Moving forward into 2019, the IEO will continue to strengthen its capacity development strategy, seeking greater synergies between its various capacity development initiatives, as well as between these and its own evaluative work.